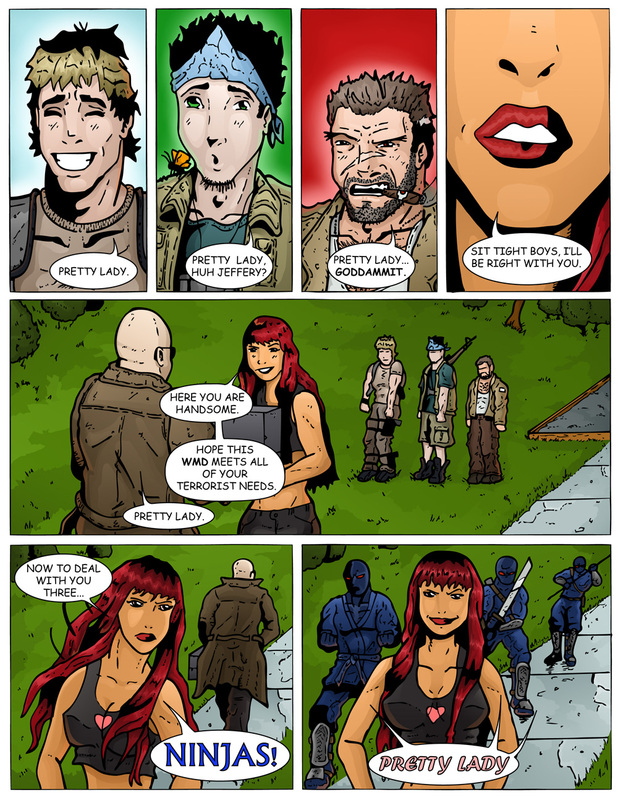 Today’s page of Team Stryker is brought to you by the letter N for Ninjas! Everyone likes ninjas. Its a proven fact. I think any comic can be enhanced by ninjas. When I first drew this page I had planned on doing all three ninjas in blue, yellow, and red but I thought they would look too much like Power Rangers and I can’t afford a law suit at this moment. The mysteriousness femme fatale of Mission 002 is inspired by multiple girls I’ve known as well as the effect that said girls had on me through my formative years. When I was younger and a cute girl would say two words to me I would turn into a mindless zombie with the only thought in my head: pretty lady. When one girl can turn 3/4 of Team Stryker into putty with just one flicker of her seductive eyes. I’m still waiting for the proof to the print version Mission 002 in the mail. I have to order the issues from Florida and have them mailed to me up in here in chilly Calgary, Alberta Canada. It takes several weeks to arrived and I have to order a single proof issue to make sure that it is made correctly before I can mass order it. I have to order the proof months in advance so that when Mission 002 is uploaded here I’ll have print issues available for sale. It takes a lot of preparation to make sure everything goes like clockwork. Enjoy the rest of your week and I’ll check back here on Monday for page 07 of Team Stryker Mission 002! Pretty ladies have too much power! They get what they want and they know it too. Makes me mad. But they’re so pretty!